The pair have given illuminating and insightful interviews. Everyone knows that SK Telecom T1 is Lee “Faker” Sang-heyok’s team. He’s the best player in the world. But a lot of their success over the past two years can be attributed to their bottom lane duo of Junsik “Bang” Bae at ADC and Lee “Wolf” Jae-wan supporting him. Following their latest Worlds victory, both players spoke with Inven Global in separate interviews to talk about their time on SKT and life as pro gamers. They talked about life before turning pro, playing on SKT, and what their motivations are going forward. Initially, Wolf wanted to play a high-damage style: “I don’t like playing support, and I rarely play support in solo queue. In other games, I usually like to play DPS,” Wolf said. 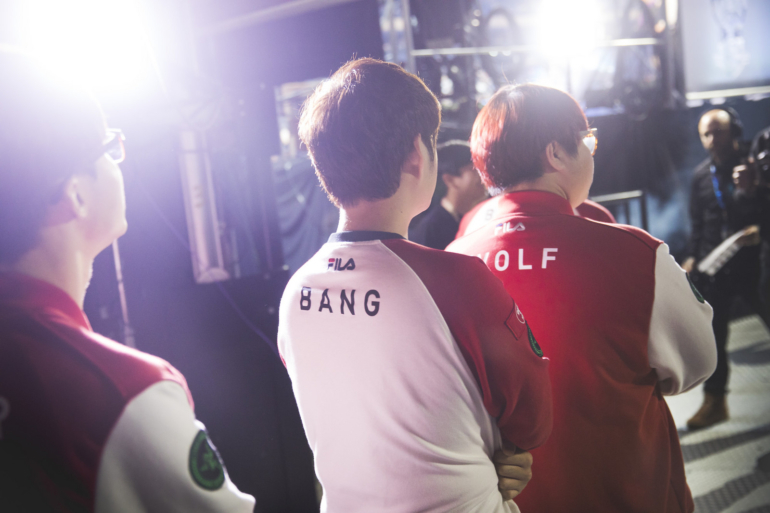 But then he had a realization: “there weren’t many good amateur supports.” So, in a decision that would shape his trajectory for years to come, he chose to practice that role while Bang became an ADC. It’s fun to watch League’s starry-eyed teenagers turn into real professionals. But there is a cost to that journey as well. The popular saying is that winning cures all, but for Bang winning in Season 5 only increased expectations and pressure in Season 6. “I began to think: ‘I won everything there is to win, but I still have to do the exact same thing all over again. I’m back to square one. Nothing really changed, except for even more pressure’”, Bang said. With his colorful personality and drive to improve, Wolf should succeed at whatever venture he sets out on.